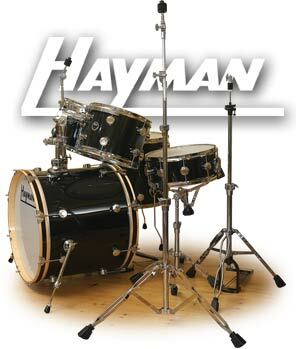 Hayman drums return to the UK stage, complete with all the power and 'cut' that made them first choice for the loudest acts of the sixties and seventies. The original 'Vibrasonic' internal coating provides enough volume to keep-up with the band, even without mics. Now, after a thirty-five year rest, Hayman drums have been updated and redeveloped, blending the tradition and innovation of the original designs with the benefits of the very latest production techniques and processes. It is not often the drum market sees a new face, especially one that offers something genuinely different, but if you like your beats LOUD there is now a viable, affordable and seriously cool alternative to the same old brands. Please contact us to be kept informed of shipping dates, authorised dealer appointments and the latest product news. ©Hayman Drums Ltd. 2015. All rights reserved.